At least until someone’s feelings or body parts get hurt. Even then, this crew seems to get over their bruised arms, legs, and spirits pretty quickly. It makes my heart glad to see them all out there, coming up with different things to play. I am really thankful for these friends of my children and their families. I was so enchanted by it this evening that I put off tackling Mt. Washmore (and it’s not because it’s my friend or anything), and I went out to sit on the front steps. I took Miss Sophie with me, because she enjoys hanging out there too. She is a pretty timid creature. She is buoyant and loves our family people, but when it comes to others, she does this jump forward, jump back thing with her tail wagging that gets even more confusing when she starts barking at the new person. She means well, she’s just socially awkward sometimes. Much like the rest of us. As we sat there and she did what she does best, sniffed everything in sight, our new cat who adopted us came up to say hello. She is beautiful and is about as social as any cat can be, but she has her moments like all cats. We have given her the moniker of “Luvvy” as in Mrs. Howell (from Gilligan’s Island, y’all) because she has this “fur muff” around her neck. Very luxurious. Miss Sophie finds her fascinating and announces her presence whenever she notices the feline through the window–sitting on the outside windowsill, sunning on the back porch, holding court on the front porch, wherever. 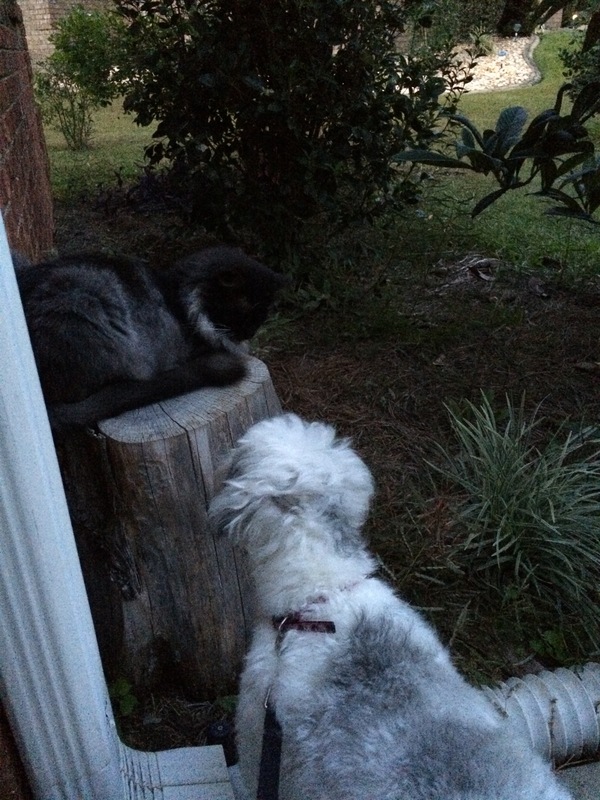 While we were enjoying the evening on the steps, Luvvy came up and walked close enough to get Sophie’s attention. My fluffy girl tried to sniff certain areas as a way of saying hello, and Luvvy had no part of it. Instead she walked by, tail high in the air, and climbed up on the cedar tree stump from where I grew up, Blackberry Flats. And that cat turned her head. Away. From. My. Pup. She knew too. She knew exactly what she was doing. Luvvy finally had enough and slowly stood up, stretched, and hopped off and wandered away. She just wanted a friend. Tonight I’m thankful for the friendships that have formed between the children on our street. I’ve gone through a similar roller coaster of emotions I did with Miss Sophie with all of my children, “I just want a friend. I want somebody to play with me. I wish I had somebody to hang out with.” Heartbreaking. But no more. I’m thankful for the balls and bicycles and make-believe that fill our afternoons and evenings. I’m thankful for laughter and tumbling in the front yard and dance steps choreographed and dreams created about rooming together at college and living next door to each other many, many years from now. These friends are the ones that sustain my crew and bring them all so much joy. May we all find someone who will welcome us and toss us the ball or sit and giggle with us, just enjoying the time spent together.